The performance of the Red Army during World War II was one of contrasts. They saw little action during their occupation of Poland in alliance with Nazi Germany, but suffered humiliation at the hands of the tiny Finnish army when they tried to invade that country too. Any remedies put in place as a result were far too little and far too late to avoid the catastrophe at the hands of the German invaders in 1941, when losses quickly ran into millions. However lessons were slowly learnt and in time losses were made good from the country’s vast resources, and just four years later the Red Army had the resources and experience to penetrate and destroy the Third Reich. In the West Russia is well known for cold winters thanks in large measure to the abortive invasions by Napoleon and Hitler, but in many parts the summers can be very hot indeed, and naturally much of the campaigning was done in the summer. As the box title promises these figures are suitably dressed for those summer days. In fact all are remarkably similar in appearance, starting with the headgear, which is the pilotka cap. This was much the most popular headgear amongst the troops, and despite the rather obvious advantages of wearing the helmet (although this was not always available) many men preferred this cap and therefore it was often worn in combat. Moving down the figure we find the classic gymnastiorka shirt in the early war form (which was actually worn throughout the war). In its summer version this was made of cotton and very comfortable. The trousers (with distinguishing diamond-shaped knee reinforcements), puttees and boots are all normal army issue, and like everything else here have been accurately sculpted. While the uniform is accurate such uniformity was perhaps less common, and indeed in the early part of the war uniform was frequently hap-hazard or even virtually non-existent. Most of the figures are very lightly kitted. Some have nothing more than an ammunition pouch, while some have a haversack and two poses have a rucksack type of pack that is quite correct. Only two figures wear the characteristic rolled greatcoat across the chest, while one of these also has the interesting grenade pouch on his belt. Only one man has an entrenching tool and one a bayonet scabbard, which is OK as few of these two items were ever issued. However instead the men were expected to permanently fix the bayonet onto the rifle, and while there are many photos showing men in action with no bayonet (another supply difficulty), we were disappointed to see not a single fixed bayonet in this set. Supply problems often left men with little kit, so any figure in this set is reasonable, although overall many men fared better than those here. Weapons are mostly the normal rifle but a few have the classic PPSh-41 sub-machine gun. The last figure in the bottom row, who is the closest thing to an officer here by virtue of his boots, trouser style and map case, seems to hold a PPS-42 or PPS-43 sub-machine gun, which is fine but much less common. 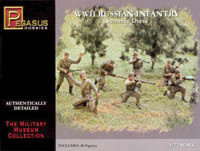 In the third row one man is using another classic weapon – the DP-28 light machine gun. This rests on a bipod that has been twisted (for the convenience of the mould – a common expedient), which in turn rests on a rather silly but hugely convenient little mould of odd-shaped rubble. Also the ammunition drum for the weapon should be on top of the barrel, not an integral part of the barrel as done here. The sculpting is very good, with great proportions and lots of realistic folds in the clothing. Unusually for Pegasus there is no assembly in this set beyond the separate base for the prone man in the third row, yet all the poses (all of which we liked very much) are nicely three-dimensional, proving that one-piece figures do not have to be flat. We found no particular flash anywhere, but the one-piece approach does mean there are some areas of excess plastic between man and weapon in all the usual places. However this is no more than average in many sets and not a particular problem here. Although a few of the poses (those in the top row) differ only in the type of weapon they carry, nevertheless this set provides a decent number of figures in very useful positions. Officers generally wore a peaked cap as a mark of distinction, but it was no unheard of for some to wear the pilotka as here. Regardless of macho bravado the helmet certainly was worn, even in the heat of summer, so this set is not a good representation of the broader Red Army in fine weather. However there are already many sets with soldiers wearing the helmet, so perhaps this set is seen as an extension of those rather than a replacement. As such it works well and has much to admire, adding interesting new possibilities for fans of the campaign in the East.